Want to be featured on LuxuryAndBoutiqueHotels.com? 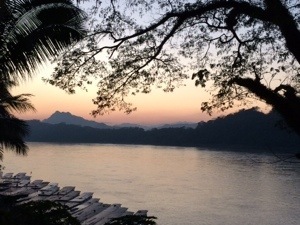 Luang Prabang, Laos — even the name sounds melodic. If you’re going to Southeast Asia, Luang Prabang should be on your itinerary. Laos is one of my favourite countries, and I’ve written a lot about it. To help you plan your trip, check out the following articles (plus don’t forget my general Asia articles). I’ve also summarized the hotels I reviewed for LuxuryAndBoutiqueHotels.com below, with links to the feature articles and to the hotels’ websites. “Heritage at risk: Luang Prabang’s Tak Bat ceremony” (for The Wayward Post). “On behalf of all tourists, I apologize Luang Prabang”. “The respectful tourist’s guide to Tak Bat, the Buddhist alms-giving ceremony”. “How to travel respectfully in a Buddhist country”. The street market of Luang Prabang, one of the 12 markets featured in Favourite food markets around the world on TravelWithKat.com. “How long should I stay in Luang Prabang, Laos?” including a chart to help you pick the right hotel for you (published on LuxuryAndBoutiqueHotels.com). “Eating high and low in magical Luang Prabang, Laos” with a recipe for my favourite sandwich (published in Taste and Travel Magazine). 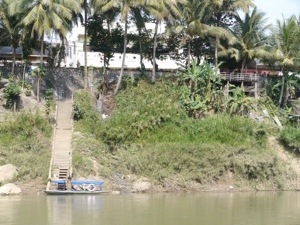 “Tropical fruit goodness and papaya jam” with a recipe from the Apsara Rive Droite (published on WorldTravelBuzz.com). “Beyond the monks and the mountain” (published on NewJetsetters.com). One of my favourite dishes (and my photo of it) is included in the Food Network’s 20 Weirdest Foods Eaten Around the World. 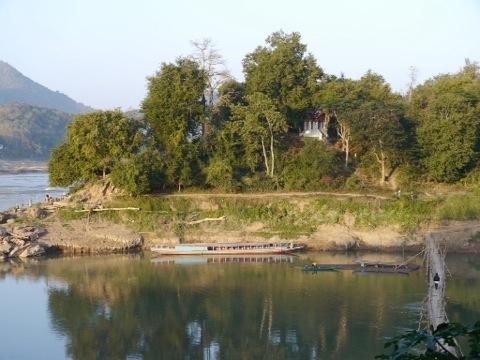 Mekong Riverview: this boutique hotel has thought of everything for guests’ ease and comfort and it has the best view in town: the confluence of the Mekong and Nam Khan rivers. 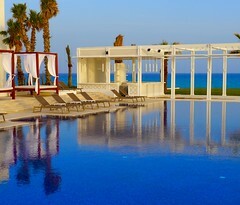 Read the LuxuryAndBoutiqueHotels.com feature HERE. Hôtel de la Paix: the most luxurious of all the hotels I stayed in, Hotel de la Paix is about a 15 minute walk to town (lucky me I got a ride in their vintage Mercedes!). A former prison, you’ll wish you were imprisoned in one of their 23 suites, especially one with a private pool. Its sister hotel is The 3 Nagas. Read more about Hôtel de la Paix HERE. The 3 Nagas: the hotel and restaurant have had some ups and downs over the years, but I’m happy to report that under the management of Mario Fluca and Kristy Danks-Brown, they’re back in top form. Even if you aren’t able to stay at The 3 Nagas, make sure you eat at least one Lao meal here. Delicious. HERE is the feature. And HERE is one of the fantastic dishes you can eat there. Villa Maly: this boutique hotel is just far enough outside the UNESCO zone that it is allowed to have a pool. 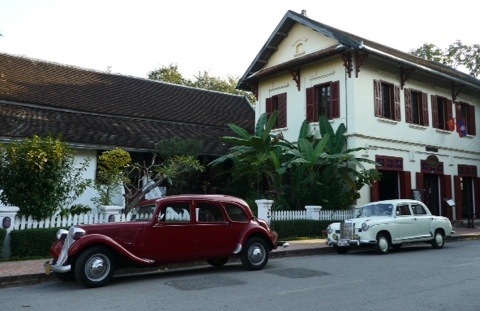 One of the beautiful buildings used to be the home of a Lao princess. 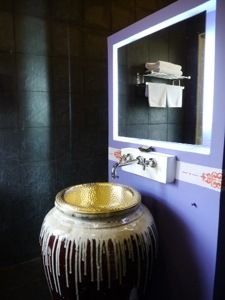 And they have super cool sinks…. The feature is HERE. 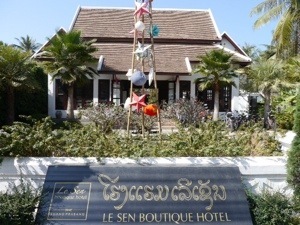 Le Sen Boutique Hotel: a rarity in Laos — a locally owned and managed hotel. Le Sen is modern minimalist with all the conveniences, including a pool and a gym. It is in a real Lao neighbourhood, about a ten minute walk to the night market. The LuxuryAndBotiqueHotels.com feature is HERE. 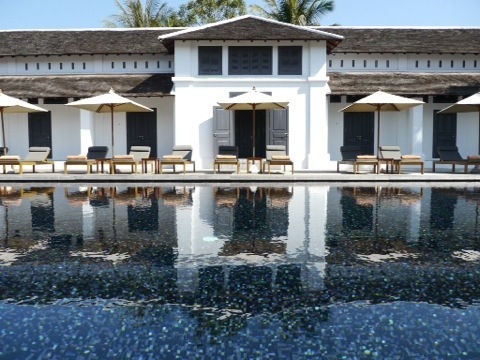 Apsara Rive Droite: just two minutes across the Nam Khan river (in the Apsarian Queen) from the UNESCO zone, the Apsara Rive Droite is the chic and airy sister of the Apsara in town. 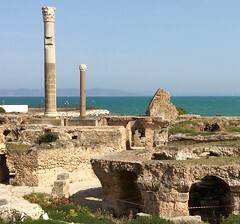 It has a pool and is an escape from the charming, but busy, UNESCO zone. Click HERE to read more. Note: my stays were complimentary, courtesy of each hotel, but all opinions are my own and no one from the hotels reviewed or approved my text. The pictures are absolutely beautiful! I am tempted to go visit Laos. 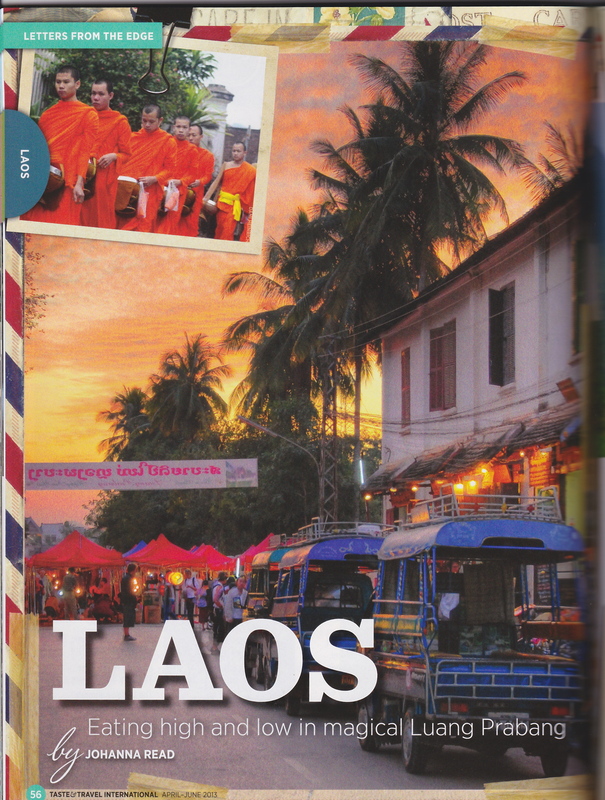 Laos is great – I strongly encourage you to visit! 2019: A Caribbean cruise with Viking (Puerto Rico, BVIs, Antigua & Barbuda, St. Lucia, Barbados, Dominica, St. Kitts & Nevis, Sint Maarten/St. Martin, USVIs). San Miguel de Allende, Mexico. Costa Mujeres, Mexico. Tofino, BC. Montego Bay, Jamaica. Cabo San Lucas, Mexico. And…??? 2018: Siem Reap, Cambodia. Singapore. La Paz, Mexico. Terrace, BC. Nanaimo, BC. Panama City & Rio Hato, Panama. Shaanxi & Shandong, China. Johannesburg, Durban, Cape Town & Port Elizabeth, South Africa. Ann Arbor, Michigan. Puerto Vallarta, Mexico. Victoria, BC. Nanaimo, BC. Door County, Wisconsin. Pacific coast, Costa Rica. Puerto Escondido, Mexico. Charlevoix, Quebec. Edmonton, Alberta. El Salvador. Kamloops, BC. New York City (& Hogwarts!). Sidney, BC. Provo, Turks & Caicos. 2017: Uganda. Seattle, Washington. Edmonton, Alberta. Lexington, Virginia. Prince Rupert, BC. New Braunfels, Texas. Madison, Wisconsin. Haida Gwaii, BC. Victoria, BC. Elkhart Lake, Wisconsin. Cabo San Lucas, Mexico. Puerto Morelos, Mexico. Nanaimo, BC. Riviera Maya, Mexico. Singapore. Siem Reap, Cambodia. 2016: Argentina, Uruguay & Brazil. Palm Desert, California. Hong Kong, Fujian & Jiangxi, China. Hot Springs, Arkansas. Nimmo Bay, BC. Cuba. Nashville. Scotland. Iceland. Chicago. Ottawa. Branson, Missouri. Kauai, Hawaii. Nelson, BC. Canmore, Alberta. My article on #SanMiguelDeAllende for @tastetravelmagazine. #SMA is such a pretty city and has fab food! Featuring @liveaquasanmiguel, @cunadetierra, @casadragones, @therestaurantsma, @zibuallende, @bovinebrasserie and more.